: Board Collector: Nectar Thruster- Part 1.
" I got a call from Mike Tomson, to say he had a guy in California who wanted me to do a surfboard model for him. 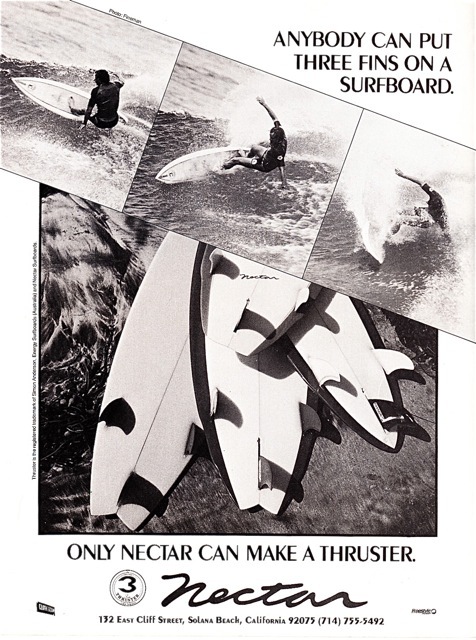 His name was Gary McNabb, from Nectar Surfboards, and he wanted someone in the top 10 to produce a model with, and I was the only guy who was available without existing endorsements. So, after Hawaii I went to California to meet with him and he said, 'Okay, what do you want to do? What sort of model do you want to bring out? 'And I said, 'I want to do a three fin model.' I'll never forget the look on his face. He'd found his top 10 pro to help him market his surfboards and he turns out to be some crackpot wanting to stick three fins on a board. But to his credit he went with it and we produced a few boards to take to this trade show in Orlando, Florida, on the east coast. I spent two or three days there sitting with my Thrusters in the Nectar booth and I was pretty much the laughing stock of the trade show. I hadn't had much experience with US style trade shows and I remember overhearing these two guys talking and they were saying how the hottest new product at this trade show was this new type of beach mat. There I was thinking I was on the cusp of revolutionising surfboard design forever and I was overshadowed by a beach mat. I met all the major surf shop guys from the East Coast, Grog and Tony Giordano from Jersey amongst others. They were interested but not about to take a gamble on an unproven design. I wasn't too fazed by the response, or lack of it, in America. Straight after that first surf on the first Thruster I thought this thing was going to change surfboards forever. After going to the US I thought I might have to revise my expectations. People just weren't enthusiastic about it and, really, I wasn't that surprised. I think surfers are conservative by nature. Surfing is sometimes seen as this really rebellious, counter culture activity, but surfers are basically like the rest of the population - they don't like new things and they don't like to be challenged. They're not very accepting of change. have to win a contest on it." history. Wonderful guy. It was more fun working with this guy than any other guy I worked with and he's always a pleasure to be around." 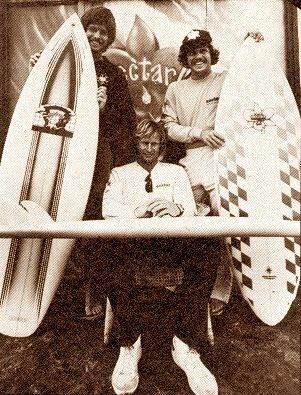 RUSTY PREISENDORFER: 'January 1981, I had just finished an epic midday session at Blacks. Low tide, hollow, six to eight foot, lined-up but almost every wave make-able. Conditions were A plus, high pressure, hot, no wind, textbook winter perfection. I'm starting the walk back to the road from North Peak, and I see Greg Mungall walking up the beach with Simon Anderson. I knew Greg. turn and proceeded to spin out. Greg was a great surfer but his board was not the right tool for big Blacks. Simon dropped in on his first wave. It was a solid one. Simon dropped straight down the face and squared off, came straight back up the face of this hollow beast, almost past vertical and threw a mind bending gaff, drove down the .face, squared off again, pulled in, came out and threw a few more big hooks to finish off. My jaw hit the sand. I sat there.for two hours and watched some of the best surfing I'd ever seen. I'd been judging pro contests for a few years, including several Pipe Masters. I had seen good single-fin surfing. And I had seen good surfing on twin-fins. But this was something on an entirely different level. And, of course, it went on to change everything. I tripped on the experience for a couple of days, wrestling with the thought, was it the board or the surfer? My mind said it was 9O% Simon. After a few days, WTF, I stuck a trailing fin on my favorite twin. My first surf on the jury-rigged tri-fin was in decent surf but nowhere as good as Blacks on that day I watched Simon. First impression: board was noticeably slower but had squirt out of turns on the better waves. It felt like the parking brake was on but when I drove off my back foot hard enough the board would come back up to the speed it had as a twin ... just briefly, and as soon as I let off it would slow down again. I shelved it." Quoted from "Thrust- The Simon anderson Story". I have a NECTAR Simon Anderson board, 7'2 ", white color with red border. I'm from Brazil. Do you know how much this board is worth?